Due to Pilot Union Strike, the latest flight information from February 8 to February 11, 2019 are as below. Cancelled CI711/712 KHH – MNL v.v. CI933/934 KHH – HKG v.v. CI915/916 TPE – HKG v.v. CI023/024 TPE – ONT v.v. CI861/862 TPE – PNH v.v. CI935/936 KHH – HKG v.v. CI601/602 TPE – HKG v.v. CI176/177 KHH – KIX v.v. Delay CI120/121 TPE – OKA v.v. CI503/504 TPE – PVG v.v. CI521/522 TPE – CAN v.v. CI055/052 TPE – SYD v.v. CI188/189 TPE – PUS v.v. CI919/920 TPE – HKG v.v. CI927/928 TPE – HKG v.v. CI711/712 KHH – MNL v.v. Delay CI935/936 KHH – HKG v.v. Below Copyright Photo: China Airlines Airbus A350-941 B-18902 (msn 057) ONT (Michael B. Ing). Image: 945645. 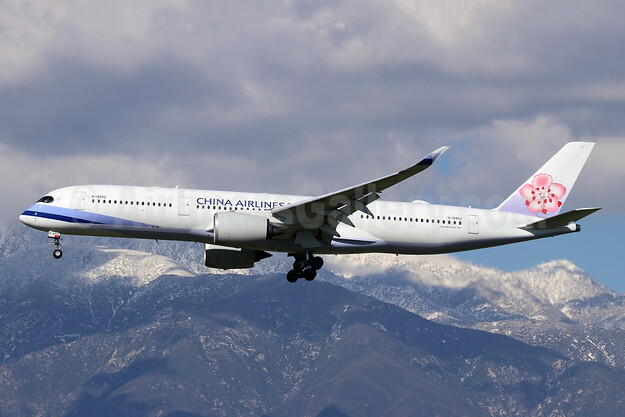 This entry was posted in China Airlines and tagged Airbus A350-941, B-18902, China Airlines, msn 057 on February 9, 2019 by Bruce Drum.